This past weekend I flew to Sydney for All Day YA, a special young adult literature event, held as part of the Sydney Writers’ Festival. It was hosted on Saturday 27th May at the Riverside Theatre in Parramatta. There were 10 events. Although there were two events being run simultaneously in the two theatres, so it was only possible to attend five events. There was an all day pass for $50, which allowed guests to choose 5 events. In the courtyard there were food trucks, games, a photo booth and an author signing table. I started my morning with a panel on Australian Young Adult Fiction, Love OZ YA Anthology: Begin, End, Begin, featuring Danielle Binks, Amie Kaufman, Will Kostakis, Jaclyn Moriarty and Gabrielle Tozer. #LoveOzYA started as a hashtag in response to a lack of awareness surrounding Australian young adult fiction and to celebrate it. 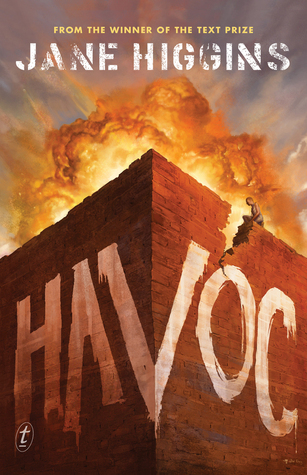 Binks edited an anthology of short stories by 10 Australian YA authors. Kaufman, Kostakis, Moriarty and Tozer all contributed stories. I have yet to read this anthology but my public library has copies so it is on my list. Next up was Keeping Company: Characters Across a Series moderated by book vlogger Catriona Feeney (Little Book Owl) with James Bradley, Amie Kaufman, Garth Nix and Lynette Noni. When discussing side characters Kaufman gave the analogy as them being like seasoning. They can add flavour to your main character and story but be careful because they can also overpower and spoil the whole meal (story). Kaufman pointed out that if you live in the Illuminae world you have a 32 percent chance of survival. She also revealed that the third book in the series is like an Avengers movie, where everyone from the first two books comes together. When discussing the notion that YA is lesser than adult fiction Nix pointed out that it is “called young adult not old children”. YA is not adult fiction dumbed down! Bradley explained that good writing comes when you go somewhere dangerous and take risks. 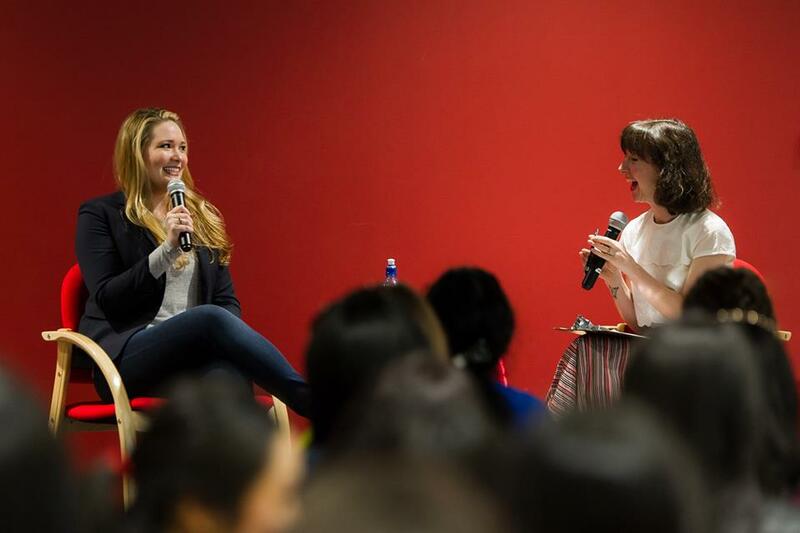 Nix said if you can find the emotional truth in a story, everything else will work. Noni said to ensure that a character is engaging across a series you need to make them real. She also said that her characters take over the story and she is constantly fighting them as she writes. Nix said that he does not know very much about his characters when he starts and he learns about them as the story progresses. In a nice gesture Nix gave out copies of his books to audience members who asked questions and he also brought Frogkisser character cards that he gave out at the signing. After lunch I attended a panel More Than Meets the Eye: Diversity in YA Fiction moderated by journalist and author Sarah Ayoub with Australian authors Randa Abdel-Fattah, Erin Gough and Will Kostakis. At first Ayoub was a little nervous, but of all the panels I felt she was the most prepared moderator with really insightful questions. Abdel-Fattah, an Australian Muslim of Palestinian and Egyptian parents, talked about how identity is fluid and that it is she who defines herself – one day she may be listening to Palestinian music and the next day watching something very Australian on TV. There was plenty of humour thanks to Gough and Kostakis. Gough quipped “I don’t wake up and look in the mirror and say ‘Hey, look, it’s Gay Erin’ … okay sometimes I do.” She later joked “did you know my parents are straight”. Kostakis also said that we all have stories but we are often told our stories and experiences do not have value. He also gave a simple piece of writing advice – if you are ever stuck with a story idea just take your life and ask what if? Abdel-Fattah said when writing it is important to be aware of power relations. She explained that she would never presume to write a story about the Aboriginal stolen generation. That is not her story to tell. Gough encouraged writers to talk to people and do research to better represent diversity. When asked for diverse book recommendations Kostakis recommends “anything by Sara Farizan”; Gough recommends Welcome to Orphancorp by Marlee Jane Ward and Pink by Lili Wilkinson; Ayoub recommends Bro by Helen Chebatte. Defying Expectations: How Do Female Writers Defy Stereotypes moderated by Bev Kavanagh with J.C. Burke, Amie Kaufman and Mariko Tamaki. Kaufman opened the panel by reading two emails from her ‘jerks’ folder. One gave her advice on genres other than sci-fi, which would be better suited to her female sensibilities and the other suggesting that Jay Kristoff is the sole author of the Illuminae series and that her name is only there because of her New York Times best-seller status. This led to a discussion of being female and writing in genres that are traditionally male dominated, such as science fiction. Burke also discussed writing in the traditional male dominated genre of crime fiction and being the second female to win the Ned Kelly award and the first young adult title win. Kaufman also talked about flipping the gender of characters during the editing process to avoid subconscious gender bias / stereotypes. I ended the day with TeenCon moderated by author Will Kostakis. As the audience entered the doors to the theatre we were given free copies of books. I was given Cath Crowley’s 2016 novel Words in the Deep Blue. This is Crowley’s sixth book and I look forward to reading it. Click here to read my past book club pick post for Graffiti Moon. Representatives from eight publishing houses presented some recent and upcoming YA titles to get excited about. Kostakis also played a game of heads or tails with book packs for the last one standing. Audience members also had a chance to win books by competing against the publishers in a ‘Reworking the Classics’ competition – think Harry Potter with more diversity and The Hunger Games series where President Snow is Donald Trump and Katniss is Hillary Clinton. Also on during the day were Writing in Verse: Sarah Crossan in Conversation; Expressing Herself: The Brilliant Life of Rupi Kaur; Mariko Tamaki Talks the Talk; Talking Tough Topics with Jennifer Niven; and Fresh Voices from Western Sydney: A Showcase of Real Talk. 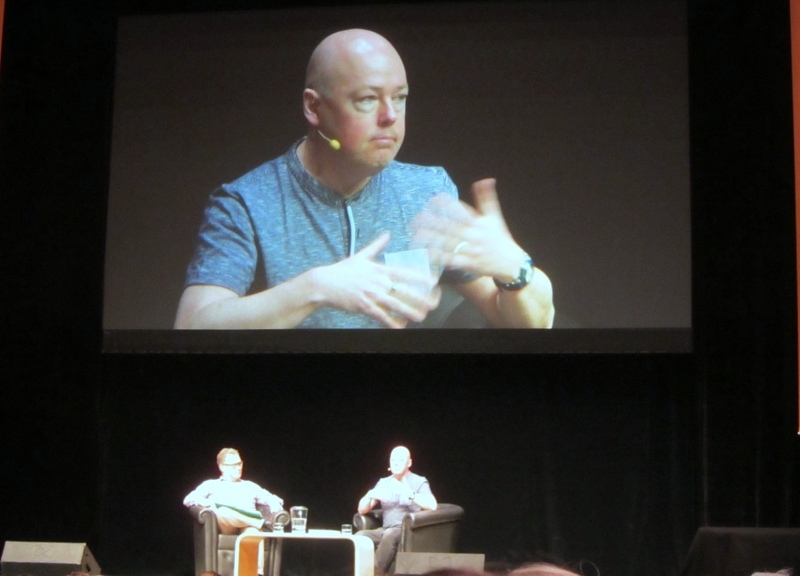 Yesterday morning I attended a talk with author John Boyne as part of the Auckland Writer’s Festival. John Boyne is best known for his young adult World War II novel The Boy in the Striped Pyjamas (2006) and the companion novel The Boy at the Top of the Mountain (2015). 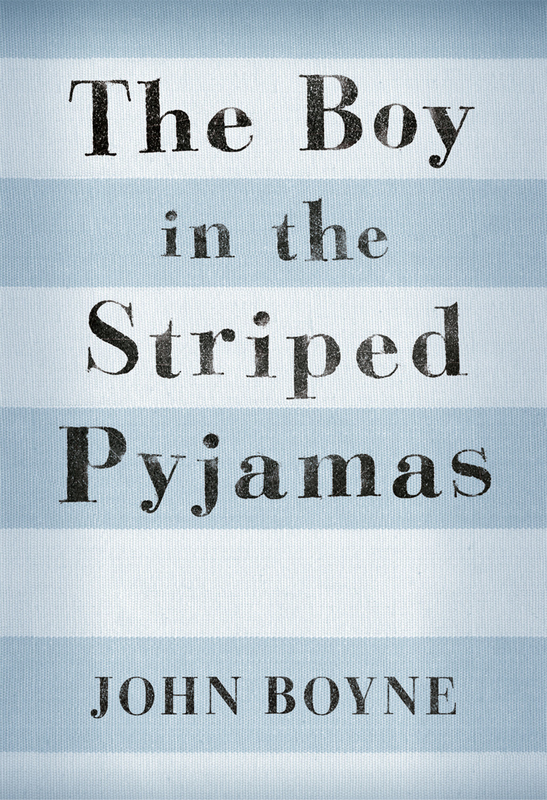 The Boy in the Striped Pyjamas was my book club pick for March. You can read my review here. The one hour talk ‘The Narrative of History: John Boyne’ was hosted by journalist Guy Somerset. The focus of the talk was on his adult novel A History of Loneliness, which explores the issue of sexual abuse and cover up by the Catholic Church in Ireland. He talked about how when you are from a small country, such as Ireland, people expect you to write about where you are from. An expectation that is not put upon writers of countries, such as England and the United States. He resisted writing about Ireland until he had ‘something to say’. 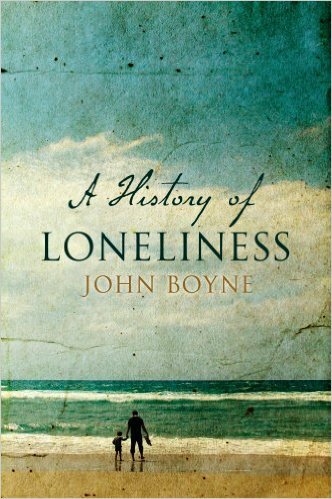 John read two excerpts from A History of Loneliness. Powerful stuff! The Boy in the Striped Pyjamas is both his most popular and unpopular book. He is proud of the work and does not mind that it sometimes overshadows his other work. He is also fine with the criticism levelled at the book as literature should ‘create debate’. The Boy in the Striped Pyjamas will celebrate its 10th anniversary this year. A special collector’s edition will be released later in the year illustrated by Oliver Jeffers. So check that out. The most powerful moment of the talk was during the audience Q&A portion when a young woman about to take her A Levels asked for advice on recovering from abuse. He told her that the fact she can stand up and talk about something so personal in front our a group shows that she is much stronger than she realises. John will next be appearing at the Sydney Writers’ Festival in Australia. If you go let me know what you thought? 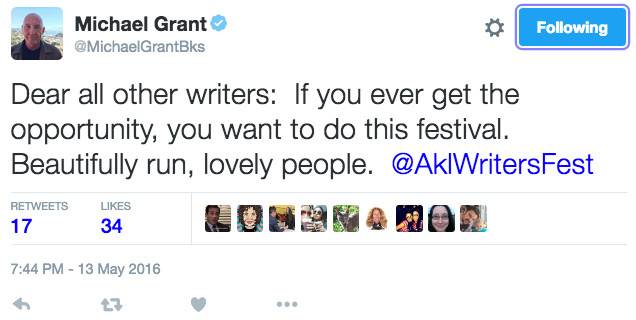 If you attended the Auckland Writers Festival what did you think? Have you met one of your favourite authors before? Let me know in the comments. Yesterday morning I attended a talk with author Michael Grant as part of the Auckland Writer’s Festival. Michael Grant is the author of popular young adults series, including the dystopian Gone, the multi-platform BZRK, and his new World War II trilogy Front Lines. 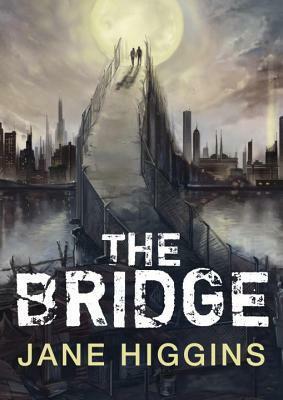 The one hour talk was led by award winning New Zealand young adult author Jane Higgins (The Bridge, Havoc). From the beginning before Jane had even introduced him, Michael showed his sense of humour, which would be present throughout, joking about there being vodka in the water jug. The first part of the talk focused on his new novel Front Lines (released January 2016). He played the book trailer and then they discussed his research process. As a fiction writer he has a creative license, for example to create his own ‘supreme court decisions’, such as the ruling that women could enlist in the armed forces during WWII. He noted though that he wanted to get the technical stuff right. Michael has already written the second novel in the Front Lines trilogy and has delivered it to his publisher. Michael talked about the processing of writing a book series. Before he starts he writes his version of a ‘series bible’. He uses this document to sell his concept / idea to a publisher and this bible is what will help him shape the series. When creating characters sometimes he will often use Google to ‘cast’ his characters. He searches for headshots of young teenagers. A picture will jump out at him, he won’t know this young woman or man but this will be the basis of the character he writes. He normally writes about two books a year but has written three books in a year before. When he was writing smaller books he could write fourteen books in a year. Michael rubbished the notion of writer’s block. He joked that he did not get waiter’s block when he was waiting tables or cleaner’s block when cleaning houses. His advice for aspiring writers struggling to write is to just sit down and write – he said that you might throw out forty pages but somewhere in there, there will be something. When asked about his thoughts on the young adult divide Michael said quite simply that young adult fiction featured young adults. During the audience Q&A portion he was asked to recommend a young adult book. He said we may be surprised but he does not read young adult fiction as he does not want take someone else’s ideas. He did recommend his wife’s book though because of ‘co-checking accounts’ lol. Michael is not adverse to killing off characters when it serves the purpose of the story. He joked that he thought of his characters as his ’employees’ – it is a ‘family business’, but if they aren’t performing he will kill them off. When talking about the Gone series he said that he was inspired by the television series Lost, which is essentially Robinson Crusoe (Daniel Defoe, 1719), which in an essence is the expulsion from the Garden of Eden. He addressed the point that the characters in the Gone series are under 15 as oppose to being older teens. He said that young people are intelligent and capable of doing the same things as adults. He also joked that an 11 eleven year old kid walking down the street holding a bottle of booze is very scary but an 18 year old walking down the street is just another night in LA. Good news for fans: He is planning another book set in the Gone universe. It is not a sequel in the traditional sense but may feature some characters from the Gone series. Click here to read my review on Gone, the first novel in the Gone series. Book club pick for May. Michael will next be appearing at the Sydney Writers’ Festival in Australia. If you go let me know what you thought? 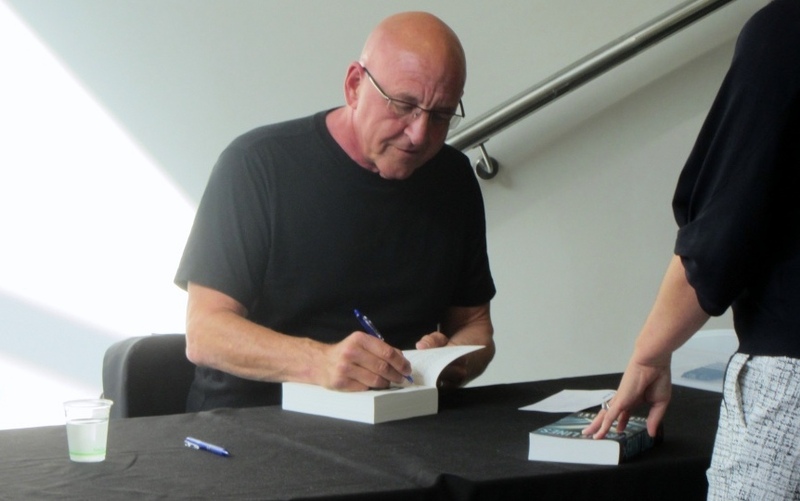 If you attended the Auckland Writers Festival what did you think? Have you met one of your favourite authors before? Let me know in the comments. 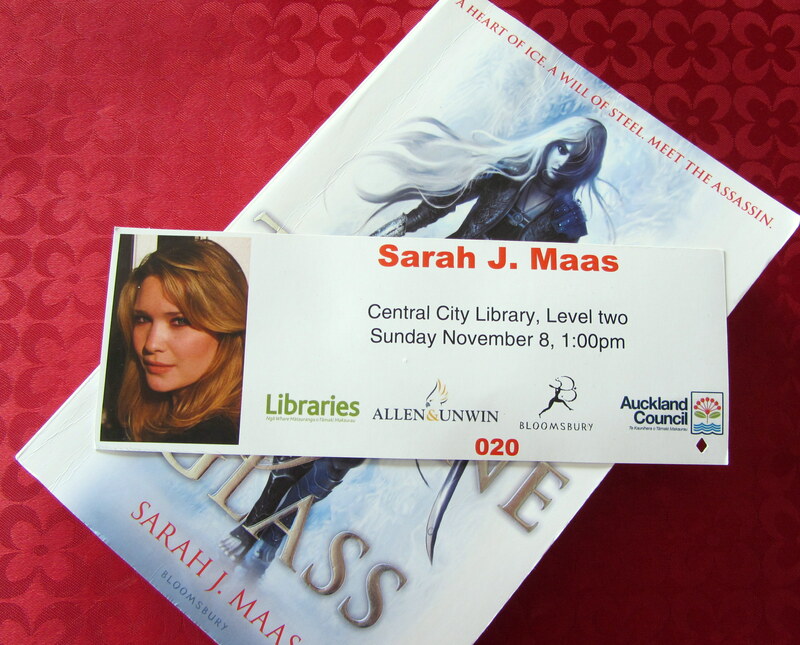 Last month I attended an author talk and book signing at Auckland Central Library with Glass of Throne author Sarah J. Maas as part of her Australasian tour. It was Sarah’s only New Zealand event before she toured New Zealand, travelling from Auckland to Queenstown, visiting filming locations from Lord of the Rings. 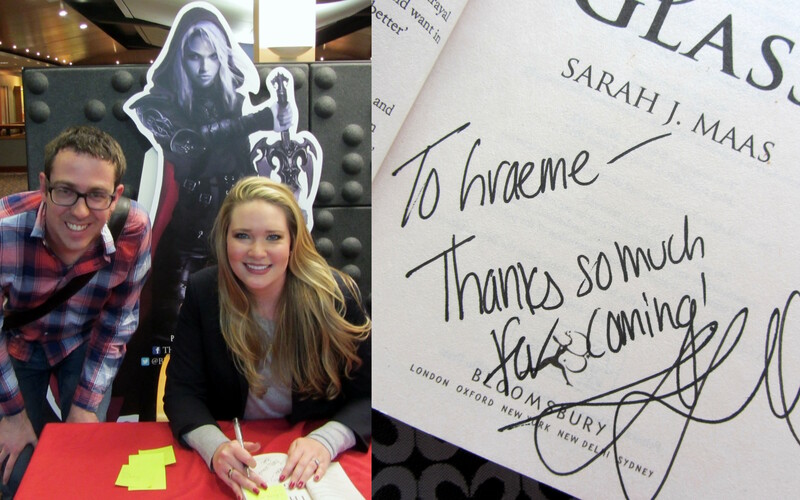 Jenna from Time Out Bookstore hosted a 30 minute question and answer session with Sarah. Sarah talked about her obsession with Lord of the Rings. She joked about growing up with a life-size cardboard cut-out of Legolas (Orlando Bloom) in her bedroom. The area around mouth worn out from its supposed make out sessions. 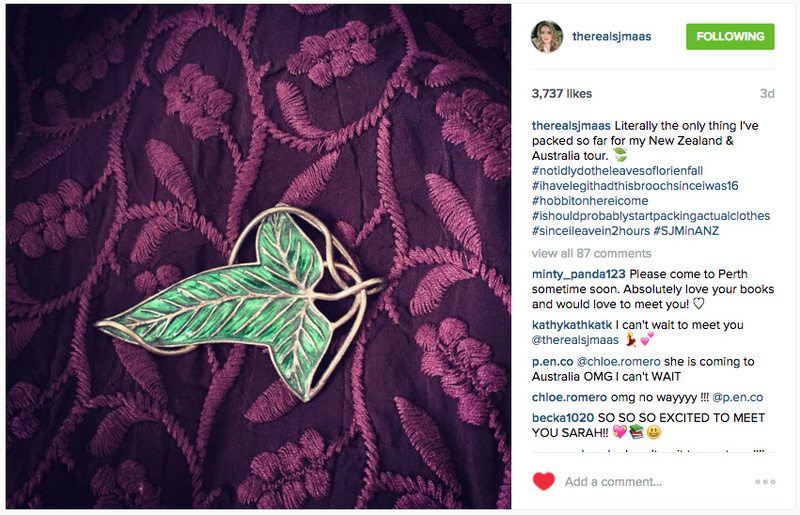 She is clearly a fan herself from her love for LOTR and binge watching Gilmore Girls on Netflix. Sarah also gave her top tips for first time visitors to New York City. She recommended seeing a ballet at the Lincoln Center, the Metropolitan Museum of Art, a walk through Central Park and the High Line (a elevated rail freight line converted into a public park). Following the Q&A Sarah did a book signing and photo session. It was obvious Sarah cares about her readers taking time to talk with each guest, spending four hours to get through the line. 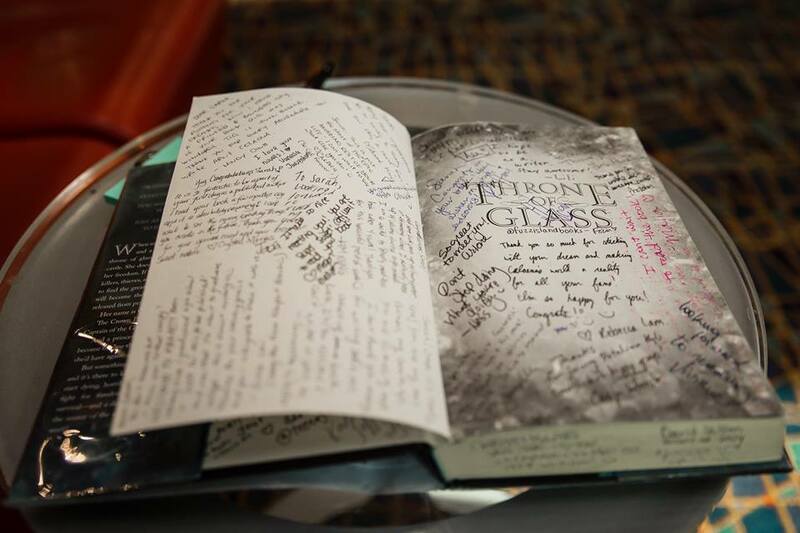 She also invited guests to sign her copy of Throne of Glass.